If you are looking for the perfect underwater kingdom, the Great Barrier Reef, with its teeming marine life of numerous dolphins and whales, six species of turtle, and more than 150,000 tropical fish species, is exactly what you are looking for. And a unique way to explore this underwater world of extraordinary creatures is scuba diving at night time when you get to see a completely different scenario. Night is the time when the reef animals, thousands in number, can be seen unlike day time when they are extremely shy to expose themselves. The good news is that night dive options for exploring the Great Barrier Reef is available in which you can experience the incredible colourful fish following the torchlight with great enthusiasm, and you get to see a world that has nothing to do with terrestrial life. Your night diving adventure may also give you the opportunity to view the bumphead parrot fish, nocturnal black spotted and dog face puffer fish, clownfish, sea turtles and the epaulette sharks taking rest in the thick of the corals. Among other creatures that you can view include the lionfish and the reef sharks as well as the countless coral species. Several companies organize such scuba diving tours, among which a few operate from the Norman Outer Reef. The Outer Barrier Reef pontoon which is stationed here is the best spot for night diving adventure. You will also come across an underwater aquarium situated in this location where you will get to know more about the marine life of Great Barrier Reef. In the aquarium, the lights attract the wildlife of the underwater world that adds to the excitement of aquarium tour. 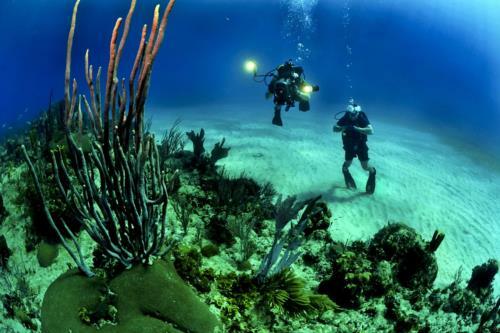 It is crucial to properly organize and plan a dive, especially the night dives. Apart from the standard guidelines and rules to be followed, here are some extra procedures to help you make the night diving experience pleasant and memorable. 1) Avoiding the Unknown - In order to ensure your safety and orientation, you are recommended to select a relatively shallow as well as easy site for the night exploration. You don’t want to be in any unfamiliar setting while diving in the dark, or fight against strong currents as such things can lead to serious accidents. 2) Effective Communication - You will not be the only one diving in the dark which is why you should make sure that your underwater communication system with other divers is made clear before stepping into the water. You should be agreeable on the signals to be used which will be taught to you in your pre-dive briefing. Double-check on these signals with your buddy before you take the leap. 3) Suit and Area Check - Don’t forget to check your dive suit in the sunlight. It will help you familiarise with the suit. Also, note down the recognisable items on the site you select for night diving so that you stay oriented at the time of night dive. Your sole additional equipment for the night dive adventure will be lights. 1) Primary and Secondary Lights - You will be provided with a wide beam torch that will serve as the primary dive light. A secondary light will also be provided to you for your night dive entourage which will be tucked into your BCD’s pocket. You will be in charge of both the primary as well as the secondary lights, and in case the primary light fails, the secondary light can be used for aborting the dive safely. 2) Turn On the Light Only Once - After you have turned on the light you will have to leave it on until the end of your dive. In most cases, the light fails on turning it on. Instead of turning on and off the lights during the tour, you can simply hide it by pointing the light at your body and allowing it to absorb darkness by holding the light in that position. 3) Extra Light for Safety - You may also be given a chemical stick or small light that you have attach to your regulator’s first stage as it will ensure that others see you in case your light fails. If for some reason you lose sight of your buddy, you need to get started on the “lost buddy procedure” for which you will receive information before the dive. 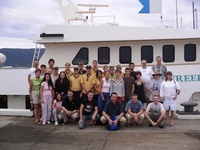 Be it your first night diving experience in the Great Barrier Reef or one of the many you have been through before, it is essential to keep the above-mentioned tips on your mind so that you can safely enjoy your tour. First dive ever - the Great Barrier Reef!